Winnipeg - While it may be the last quarter of the year with sales activity slowing down in comparison to the spring market, it was not the case for the upper tier of the residential-detached market. Five house sales all went for above $1 million with one commanding $2 million. 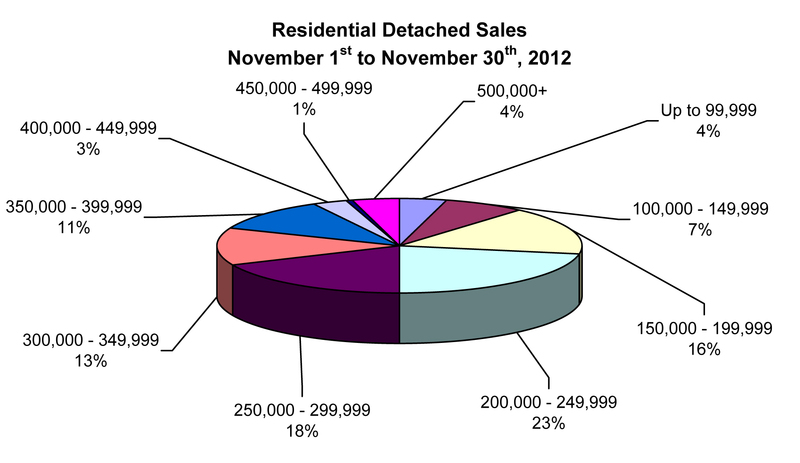 November 2012 MLS® sales are only second to 2011 and 2007 where sales in the high 800s are virtually identical. Interestingly enough these are the two same years 2012 is competing with for the overall best year on record for total MLS® sales. With an extremely thin marginal lead over 2011 and behind by a little more than 1% in sales generated in 2007, December 2012 will have to take advantage of and count on converting its far greater inventory of active listings than existed in 2007. By doing so, it will also edge out 2011 as well. Despite sales being off the record level set last year in November the dollar volume for the second year in a row eclipsed $200 million and reached a new milestone for this month. It is also noteworthy that with a month to go, the year-to-date dollar volume has exceeded $3 billion for the second year in a row and will easily surpass last year’s level in early December. November MLS® unit sales decreased 4% (847/881) while dollar volume was up 7% ($215.8 million/$202.1 million) in comparison to the same month last year. Year-to-date MLS® sales totaling 12,392 are in a virtual deadlock with 2011 with only 25 more units sold. However, year-to-date dollar volume is up 6% ($3.05 billion/$2.88 billion) in comparison to the same period a year ago. Listings entered on MLS® this year of 18,063 are up less than 2% over 2011. It is important to point out that even with MLS® unit sales being so similar in numbers to 2011 there are more differences than you would expect in the mix of different property type sales activity and variances within MLS® areas throughout the greater Winnipeg market region. For example, vacant land has experienced an increase of 25% this year and represents 5% of all MLS® unit sales. The most active price range for residential-detached sales in November was the $200,000 to $249,999 price range at 23% of total sales activity. The next most active price range was from $250,000 to $299,999 at 18%. There were as many sales over $500,000 as there were under $100,000. The average days on market for residential-detached sales in November was 31 days, 3 days slower than last month and 4 days off the pace set in November 2011. The average days on market for condominium sales was 37 days, 5 days slower than last month and November 2011.